On tonight’s show Elena is devastated when she realized that she died with vampire blood in her system she must go through the terrible transition to become a vampire…or face certain death. Stefan promised Elena that he and Bonnie will exhaust every possible way out of the situation, but Damon (who was furious with his brother for letting Elena die in the first place) wants Elena to face reality. 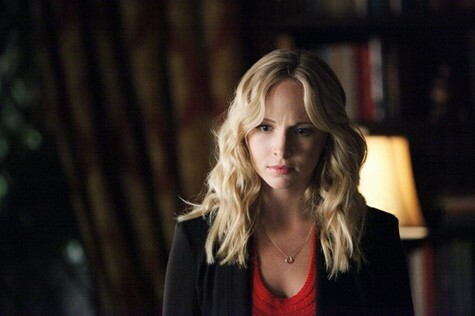 Bonnie paid a terrible price for her attempt to change Elena’s fate, while Damon took out his frustration and rage at Matt . In a rare moment of empathy, Rebekah was deeply touched by Stefan and Elena’s devotion to one another. Pastor Young and the Town Council members began rounding up the vampires and their supporters. You can read our full and detailed recap of tonight’s show HERE! Official CW synopsis of next week’s episode:A NEW DANGER COMES TO TOWN – Elena tries to cope with the extreme highs and lows that are part of becoming a vampire, and Stefan and Damon almost come to blows while arguing about what is best for her. Damon decides to help Elena in his own way and asks her not to tell Stefan. A stranger, Connor Jordan (guest star Todd Williams, “Chicago Code”), arrives in town and begins questioning Sheriff Forbes and Mayor Lockwood. Connor’s actions quickly convince Stefan that they are dealing with a dangerous vampire hunter. Jeremy and Matt are surprised to see a girl they used to know, April, (guest star Grace Phipps, “The Nine Lives of Chloe King”), has returned to town and is enrolling at Mystic Falls High. At a town gathering, Elena comes close to losing control until Caroline steps in to help her. Finally, Damon confides his feelings to an unexpected friend. On next week’s episode it looks like Elena is struggling with being a vampire and all her senses are heightened. Not only has her desire for blood increased but her desire for Stefan has. The boys (Stefan and Damon) get into a fight again, no surprise about Elena and how to handle her new desires. At one point in the preview Damon offers her his wrist to taste, which she does. Elena is having a huge problem controlling her blood lust and much to her dismay comes close to attacking someone a the local restaurant. She is sobbing with blood running down her mouth. I imagine she now understand what Stefan went through when he gave up feeding on humans. 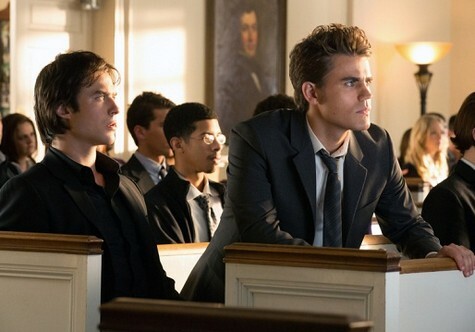 The Vampire Diaries Season 4, Episode 2 “Memorial” airs on the CW on October 18th, 2012. Check out the preview video and photos from episode 4 and let us know in the comments below what you think!